THOC5 phospho-Y225 levels were assessed in the populations shown by flow cytometry following 24 h treatment with 5 μM imatinib, 150 nM dasatinib or 5 μM nilotinib. Results are displayed as mean fluorescence intensity (n= 4) ±s.e.m. Ponatinib (AP24534) is a novel, potent multi-target inhibitor of Abl, PDGFRα, VEGFR2, FGFR1 and Src with IC50 of 0.37 nM, 1.1 nM, 1.5 nM, 2.2 nM and 5.4 nM in cell-free assays, respectively. Immunoblot of H23 cells treated with trametinib (25 nM), ponatinib (750 nM), or their combination for the times shown. Nilotinib (AMN-107) is a selective Bcr-Abl inhibitor with IC50 less than 30 nM in Murine myeloid progenitor cells. Ba/F3-p210T315I cells were treated with indicated concentrations of nilotinib with or without PDMP for 24 h. Apoptosis was determined as in A. Data are shown as percentage of sub-G1 for apoptosis in triplicate cultures. *P<0.05. Danusertib (PHA-739358) is an Aurora kinase inhibitor for Aurora A/B/C with IC50 of 13 nM/79 nM/61 nM in cell-free assays, modestly potent to Abl, TrkA, c-RET and FGFR1, and less potent to Lck, VEGFR2/3, c-Kit, CDK2, etc. Phase 2.
c, Upper panel: viable cell number of FLT3-ITD-positive AML patient samples incubated with vandetanib, danusertib, or DMSO for 7 days in methylcellulose. The mean ± SD of duplicates is shown. Lower panel: viability and proliferation of mutant FLT3-positive AML cell lines and one AML patient sample treated with vandetanib and crenolanib alone or in combination for 3 days. The calculated additive effects of both inhibitors according to the Bliss Independence model are indicated by the dashed lines. The mean ± SD of four (cell lines) or two (patient sample) independent experiments is shown. P-values were calculated using one-way ANOVA followed by Dunnett’s test for multiple comparisons. *P ≤ 0.05; **P ≤ 0.01; ***P ≤ 0.001. Berbamine (BA), a traditional Chinese medicines extracted from Berberis amurensis (xiaoboan), is a novel inhibitor of bcr/abl fusion gene with potent anti-leukemia activity and also an inhibitor of NF-κB. Dasatinib hydrochloride is the hydrochloride salt form of dasatinib, an inhibitor that targets Abl, Src and c-Kit, with IC50 of <1 nM, 0.8 nM and 79 nM in cell-free assays, respectively. Nilotinib hydrochloride is the hydrochloride salt form of nilotinib, an orally bioavailable Bcr-Abl tyrosine kinase inhibitor with antineoplastic activity. Asciminib(ABL001) is a potent and selective allosteric ABL1 inhibitor with dissociation constant (Kd) of 0.5-0.8 nM and selectivity to the myristoyl pocket of ABL1. Co-immunoprecipitation assays of UT7 BCR–ABL T315I (UT7 B/A T315I) cells with or without ponatinib (20 nm) or ABL001 (4 μm) treatment for 24 h. All protein extracts were immunoprecipitated with an anti-DNM2 antibody and immunoblotted with a pan-anti-p-Tyr antibody (4G10). AT9283 is a potent JAK2/3 inhibitor with IC50 of 1.2 nM/1.1 nM in cell-free assays; also potent to Aurora A/B, Abl(T315I). Phase 2. HEL cells were treated with 0.5, 1 or 5 uM of AT9283 or left untreated for 3 hrs. The expression and phosphorylation state of STAT5 (P-STAT5) and Jak2 (P-Jak2) was assessed by Western blot immunodetection. Bafetinib (INNO-406) is a potent and selective dual Bcr-Abl/Lyn inhibitor with IC50 of 5.8 nM/19 nM in cell-free assays, does not inhibit the phosphorylation of the T315I mutant and is less potent to PDGFR and c-Kit. Phase 2. (A) The effect of bafetinib at 3 μM on the expression levels of ABCB1 in SW620/Ad300 cells for 24, 48 and 72 h. (B) The effect of bafetinib at 3 μM on the expression level of ABCG2 in NCI-H460/MX20 cells for 24, 48 and 72 h. Equal amounts of total cell lysate were used for each sample. The effect of bafetinib at 3 μM on the subcellular localization of ABCB1 in ABCB1-overexpressing (C) SW620/Ad300 cells and (D) HEK/ABCB1 cells for 24, 48 and 72 h. The effect of bafetinib at 3 μM on the subcellular localization of ABCG2 in ABCG2-overexpressing (E) NCI-H460/MX20 cells and (F) HEK/ABCG2-R482 cells. Scale bar, 10 μm. PI (propidium Iodide, red) counterstains the nuclei. KW-2449 is a multiple-targeted inhibitor, mostly for Flt3 with IC50 of 6.6 nM, modestly potent to FGFR1, Bcr-Abl and Aurora A; little effect on PDGFRβ, IGF-1R, EGFR. Phase 1. Western blot analysis of p-histone and histone. 0-10μM KW2449 was added. NVP-BHG712 is a specific EphB4 inhibitor with ED50 of 25 nM that discriminates between VEGFR and EphB4 inhibition; also shows activity against c-Raf, c-Src and c-Abl with IC50 of 0.395 μM, 1.266 μM and 1.667 μM, respectively. PP-121 is a multi-targeted inhibitor of PDGFR, Hck, mTOR, VEGFR2, Src and Abl with IC50 of 2 nM, 8 nM, 10 nM, 12 nM, 14 nM and 18 nM, also inhibits DNA-PK with IC50 of 60 nM. After starved in serum-free medium for 24 h,A549 cells incubated with the indicated concentrations of PP-121 for 3 h,followed by 20-minute stimolation of 100ng/ml EGF. Rebastinib (DCC-2036) is a conformational control Bcr-Abl inhibitor for Abl1(WT) and Abl1(T315I) with IC50 of 0.8 nM and 4 nM, also inhibits SRC, LYN, FGR, HCK, KDR, FLT3, and Tie-2, and low activity to seen towards c-Kit. Phase 1. DCC-2036 impacts the phosphorylated and total levels of AXL and MET in different subtypes of breast cancer cell lines. MDA-MB-231, HS-578T (TNBC cells) and MCF-7 cells (positive control) were exposed to indicated concentrations of DCC-2036 for 48 h, and the phosphorylated and total levels of AXL and MET were analyzed by immunoblotting. GZD824 Dimesylate is a novel orally bioavailable Bcr-Abl inhibitor for Bcr-Abl(WT) and Bcr-Abl(T315I) with IC50 of 0.34 nM and 0.68 nM, respectively. B. Western blot analysis of phosphorylated Akt, S6 and CrkL in T-ALL cell lines treated for 4 h with 2 μM Imatinib or Nilotinib or 0.1 μM GZD824. Twenty-five μg of protein were blotted to each lane. β-Actin documented equal lane loading. Imatinib, Nilotinib and GZD824 were abbreviated in IMA, NIL and GZD. GNF-2 is a highly selective non-ATP competitive inhibitor of Bcr-Abl, shows no activity to Flt3-ITD, Tel-PDGFR, TPR-MET and Tel-JAK1 transformed tumor cells. Cell viability of K562/IR cells and their parental cell lines after exposure to different concentrations of GNF-2 for 72 h.
Radotinib is a selective BCR-ABL1 tyrosine kinase inhibitor with IC50 of 34 nM, used to treat Chronic Myeloid Leukemia. PD173955 is a potent Bcr-Abl inhibitor with IC50 of 1-2 nM, also inhibiting Src activity with IC50 of 22 nM. GNF-7 is a potent type-II kinase Bcr-Abl inhibitor with IC50 of <5 nM, 61 nM, 122 nM, 136 nM, and 133 nM for M351T, T315I, E255 V, G250E, and c-Abl, respectively. GNF-5 is a selective and allosteric Bcr-Abl inhibitor with IC50 of 220 nM. IC50 values for GNF-5-treated Ba/F3 cells expressing BCR-ABL1 or ABL1 1b mutants (a) described to confer ABL001 resistance in BCR-ABL1, (b) identified by mutagenesis screen. after 48 hours. Error bars represent SD of triplicates from three independent experiments. Significance levels in comparison with BCR-ABL1 are indicated (NS, not significant; *P<0.05, **P<0.01, ***P<0.001, two-tailed unpaired t-test). Berbamine (BBM) is a natural bisbenzylisoquinoline product isolated from traditional Chinese herbal medicine Berberis amurensis. 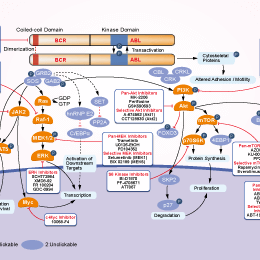 It is a novel inhibitor of bcr/abl fusion gene with potent anti-leukemia activity and also an inhibitor of NF-κB.